﻿ Dewayne and Rita Shappley report from Puerto Rico. Dec. 31, 2009. Dewayne and Rita Shappley report from Puerto Rico. 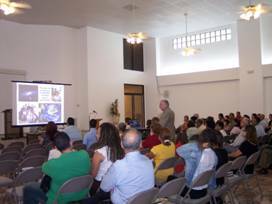 “El origen del ser humano, su dignidad y el lugar que le corresponde” -“The Human Being’s Origen, His Dignity and the Place Assigned to Him”- is the sermon being presented by Dewayne to the Bayamón church of Christ, as seen in this photograph. Several other men of the congregation also preach. -Eight baptisms in the Bayamón church. -More conversions through the Internet site and literature. -“Univisión,” powerful television producer, requests an interview. -Records on production of materials. -Important works of the Bayamón church. Norberto Ramírez, center, was converted in Ponce, Puerto Rico, after reading, as he said, “fifty-thousand things” on our Internet site. He has been a Christian for a year. We did not know of his conversion until a few months ago, and had not met him until his visit to the Bayamón church, Sunday, December 27. On the left is Luis Lugo, long-time member of the church in Ponce. The congregation in Ponce is one of some twenty-four we began, or helped to begin, in Puerto Rico. Those baptized during the time covered by this report (April 1 – Dec. 18, 2009) are: Julio Coiscou Reyes, Génesis Coiscou, Javier Álvarez, Luis Alfredo Pérez, Lester Hernández Rolón, Reynaldo Núñez, Keisla Enid Cruz Ginés and Valeria Camacho. A page of photographs showing several of these baptisms is included in this report. Considering the data provided in the following section, and information from other sources, we add 30 more to the previous total, for a Grand Total of 13,943. Through the Internet and excellent follow-up by brethren in Argentina, the church has been established in Metán, Argentina. A new congregation is meeting in La Victoria, Bogotá, Colombia as a result of contacts provided to Johnny Montaño Parra and his use of materials prepared by us (More information in the next section on both of these works). This brings the Grand Total of churches thus established to 242. -Pedro Cordero, now preaching in the Carolina, Puerto Rico church, was converted through tracts he received in San Pedro de Macorís, Dominican Republic. Some six years ago, Pedro, Dominican by birth, now living in Puerto Rico, was in his home town of San Pedro de Macorís, and while there was given tracts by some member of the church. Returning to Puerto Rico, and having read the tracts, on his way home he went right by a building identified as a meeting place of a church of Christ. He lived just four houses down from that building! The congregation in Urbanization Los Ángeles, Carolina, meets there. Pedro attended one Sunday, and was baptized the next. He is now working with the downtown Carolina church, and is in the Second Level (third and fourth years) of classes offered by the School of Advanced Bible Studies. His wife is also a member of the church. She had formerly been Seventh Day Adventist. Pedro had not belonged to any church. I had not known these circumstances of this couple’s conversion until a few weeks ago when Pedro recounted them one night at the School. -Metán, Argentina. Franco Scocco baptized through Internet evangelism. In the previous report, we noted that Franco was waiting for someone to go baptize him. He wrote, as of April 8, 2009: “Thanks to God, the Father of our Lord Jesus, for the studies sent. I will tell you I was baptized Sunday by Bro. Jaramillo. Of a truth, I am very happy to be in the church of Christ after so much searching. I give thanks to God that, by His will, Sister Ana Perera taught me many things through a Christian Chat room. Bro. Shappley, I have seen many of your debates on your site with other people, and they are very, very interesting.” Daniel Jaramillo, evangelist, of El Pilar, Argentina, near Buenos Aires, and Jorge Mercado, another evangelist, traveled eighteen hours by bus, one way, to baptize twenty-two year old Franco Scocco, the return trip taking nineteen hours. -Additional information. Ana Perera, converted herself through our Internet site, together with her husband, Armando, as we have reported previously, was a member of the Bayamón church when she engaged Franco in studies through a Chat site in Spanish. The first week of December, this couple moved to Miami, where Armando will have a better job with the company for which he works and Ana will have more opportunities for her exceptional musical talents. -Two more converted in Metán. “There are two new brethren in Metán. Their names are Juan and Francisco. More contacts lead us to foresee a great future for the work of the Lord there. We have sent a couple of brethren to help them and continue with the establishment of the church there.” E-mail from Daniel Jaramillo. -Rosario, Argentina. We play a part in the restoration of the church in Rosario. May 26, 2009. Call from Jesús and Elena Osirias. This couple has called three or four times from Argentina to express appreciation for materials sent and those on the Internet site. I thought I had mentioned this work in a previous report, but do not find any reference in recent ones. Soon after being baptized some years ago, the congregation where Jesús and Elena were worshipping stopped meeting. They had learned little. One year ago, they took the initiative on their own to start meeting again and doing evangelistic work. Now, from thirteen to fifteen are meeting, and recently three more have been baptized. Jesús and Elena download materials from our Internet site to teach and evangelize. They say they themselves have learned much from the studies. Interestingly, we were in contact with each other before other brethren in Argentina apparently were aware of a restored work in Rosario. We informed Daniel Jaramillo, in El Pilar, and on his next trip to Metán, also financed by the Bayamón church, he was able to spend some time with Jesús and Elena, an edifying experience for all parties. Rosario, a city of several million, the second largest in the country, is along the same route to Metán. –Iglesia de Cristo, Pasaje Camoati 950 Vis, Bo. Larrea, 2000 Rosario, Santa Fe, Argentina. iglesiadecristo_rosario@hotmail.com Telephone: 0054 0341 459 2806. -Bogotá, Colombia. New works begun. June 15, 2009. “Many thanks for sharing with me your replies to some contacts. You cannot imagine how important it has been for me to have on hand all the material that you make available. It has enriched us greatly, and I say ‘us’ because I have shared it with brethren in La Riviera, and now in La Victoria, all that God has allowed me to learn through you. And I say ‘La Victoria,’ because this is a barrio in the southwestern part of Bogotá where we have also begun the work of the Lord with three people who have obeyed the plan of salvation and seven more who are receiving studies. Likewise, in Niza IX, another barrio in the northern part of the city, we are sharing with a lovely group, which we are also instructing according to what we have learned from you. This group is in Sol Ángel.” Johnny Montaño. As reported previously, this man was a Pentecostal pastor who led ninety-seven of his congregation out of Pentecostalism to form a church guided by the New Testament. I have forwarded to him e-mails from Internet contacts in Bogotá. -Caracas, Venezuela. May 22, 2009. “For sometime, we have been carrying on an evangelistic work in Las Adjuntas, a small area of Caracas, with the collaboration of the church in the central part of the city. We are using the material you have available on the Internet and a quantity of tracts we received, by means of which we made the first contacts for a study of the word of God. And, most importantly, we have already had results, with one born anew last month, and others far advanced to the point of taking the step of obeying the gospel of Christ.” Benardo de la Paz Pernalete Yépez. -Cuba. Jorge Alberto Mederos Navarro baptizes sixty Catholics. “In a small town eight miles from the city where I live, the only church was Catholic, with 250 faithful, and of those faithful today 60 form the church of Christ, for the gospel was preached to them and they were baptized for the forgiveness of sins. There are 80 baptized [in the church with which I meet]. Dear brethren, thanks for the CD’s and tracts. They are a great blessing here in Cuba. We receive them without any problem.” Note: Lately, our attempts to send CD’s to Cuba have been frustrated, the US Postal system refusing to accept them. We had sent as many as nineteen to one brother, who confirmed having received them. If ever Cuba opens its doors, it will be a tremendous field for literature, cassettes and CD’s. Hopefully, our brotherhood will be prepared for the opportunity. -Ponce, Puerto Rico. 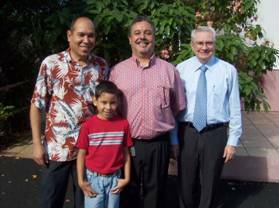 Norberto Ramírez came to a knowledge of the gospel of Christ through our Internet site, and was baptized in this southern city of the island. -Reparto Osvaldo Herrera, Villa Clara, Cuba. September, 2009. Dirúes Hernández de la Rosa states that tracts “have persuaded many people who met in denominations”. -New York, NY. November 17, 2009. Roberto called requesting authorization to make leaflets of some materials on our site with a view to distributing them. Of course, we are glad for the resources to be used in this way. -Houston, TX. November 15, 2009. Rocío called to inform us that her father has been teaching for years more or less what we proclaim on our site. We hope to follow up this contact. -Dallas, TX. December, 2009. Lourdes Rangel, a Pentecostal lady who has astured at least one church, has been calling and writing about some subjects on our site, agreeing with some, but not yet with what we teach about “women preachers.” “If you are the author of the book on tithing, accept my gratitude for your courage in challenging the spiritual leaders of the present. I would like to talk with you. I am a servant of God, living in the fear of God. God bless you. Lourdes Rangel Ministries. The Colony, TX. 972- 951 4616.” cristoenmi@sbcglobal.net Quite unusual to find a Pentecostal preacher, man or woman, opposed to tithing! In our telephone conversation, Lourdes explained that her own study of the Bible convinced her that tithing was not Scriptural. -Place unknown. November, 2009. “Thanks for this study [on tithing], a subject of interest to me. I read it on my mobile telephone, finishing at 1:12 in the morning. It is truly easy to understand, if one is spiritually mature.” Carlos. The marvel of modern technology! Reading a Bible study on your mobile telephone at one in the morning! -Columbus, Ohio. Dec. 15, 2009. “You guys have incredible material. I would like to know if I can order some.” E-mail from José Roque Santana, member of the church, after checking out some of the material on the Internet site. -“Univisión,” headquartered in Miami, is a powerful broadcasting company in the Spanish-speaking world. Its productions are seen throughout Central and South American countries as well as in the US, Mexico and Puerto Rico. “Aquí y ahora” – “Here and now”- is one of its creations, an award-winning, weekly program focusing on personal interest stories, moral issues, personalities in the news, and even, once in awhile, matters of a religious nature. Pilar Campos, one of the producers, after reading materials on our Site, called me about a dozen times during November and December, requesting I allow her to interview me for a program to be broadcast in January, 2010. She would come to Puerto Rico, with a camera crew, to do the interview. Some subjects to be covered were: “Why hoards of Catholics are leaving their church for Pentecostal churches,” and “Crass merchandising of religion by Pentecostals who preach the “Prosperity Gospel.” First, I let her know that I am a 72 year old American who speaks Spanish with an accent, and am somewhat camera shy. She countered that my “maturity” was a positive, and even paid me a little complement on my Spanish. I recommended she consider competent Spanish-speaking brethren in Miami. That was not what she wanted. -Consulting some members here, we agreed that an interview of this nature could be a double-edged sword, especially since I would have no control over editing and the final product. The views of others would also be aired on the program. Reflecting on the circumstances and praying about the opportunity, I observed to Pilar Campos that I am neither Catholic nor Pentecostal, and would not be speaking in favor of either of these religions, that, according to my perception, Catholics who become Pentecostals are “saltando de la olla al sartén” –“jumping out of boiling water into the frying pan,” a Spanish saying. Then, I sent her an e-mail stating some conditions for the proposed interview, one of them being that I be given time to present pure, New Testament Christianity. She agreed to the conditions! -As it turned out, costs for the production had gone over the limit, and the company would not underwrite the trip to Puerto Rico. Pilar then contacted a cameraman here in Puerto Rico and proposed she conduct the interview with me over the phone. Again, I consulted a trusted brother here, and we both agreed it would not be wise to accept that kind of interview. During our conversations, Pilar made some comments indicating she had read more than a small amount of the material on our Site, and was genuinely interested in the biblical stance we take. Perhaps this could have been an opportunity to make a brief presentation of the pure gospel to scores of thousands in a number of countries via television, but it did not become a reality. -I have given this detailed account because, in my estimation, it highlights the value, quality and impact of at least some material on our Internet site. To God be the honor and glory. I just want to be useful in setting sound, biblical teaching before the Internet world. -Total visits to our Internet site www.editoriallapaz.org for the year 2009………….1,104,221. -This is the first year in the history of this project, dating from 2003, that we have gone over one million visitors in a single year. October and November of this year have been the two months of highest traffic on the site. Following, is the corresponding data. -We have added much new material to the Site since the last report, plus significant revisions of various titles already available. For example, 25 new titles were added during November. A large part of this material is used in the School of Advanced Bible Studies, in San Juan, and in congregational Bible classes for different age groups. Some of it is also evangelistic in nature. Since the last report, we printed 304 books (including 40 copies of a 527 page book), plus 1,734 booklets (8½ x 11) and multipage studies. Audio studies were copied to 443 cassettes. I had projected printing more tracts, but gave priority to other projects, especially Internet outreach, in consideration of the growing number of visitors to the Site. Indeed, it seems that a complete view of “Materials produced” should include “Page views” (Documents accessed) on the Internet. Each “Page” viewed is a “Document” opened by a visitor, the equivalent of receiving and opening a tract, booklet, Bible lesson, sermon, conference or more extended study, with the exception of a small number of “Content Pages” for various key subjects. Even these “Content Pages” contain a certain amount of teaching and graphics. For the year 2009, visitors opened 2,291,604 “Documents.” The monthly cost to the Bayamón church for providing these “Documents” is $84.90. The “cost” to me in their preparation is a large amount of mental energy and a lot of time, both of which I gladly spend for the cause of Christ and, hopefully, in general terms, the good of humanity, as well as the church. The cost, in dollars, of printing and shipping that much material, a substantial part of it in full-color, would be very, very high. Lord willing, in January we will print additional quantities of tracts. Speaking of “Priorities,” this report is about three months late, mostly because I was so busy with the preparation of materials for the Internet and use in classes, both in congregations and the School of Advanced Bible Studies. -$12,000.00 special contribution for various projects in India. Broadening our vision of evangelistic and benevolent programs throughout the world, we chose India as a field where there are great needs and great opportunities. Acting on specific information obtained from Bro. Clyde Randolph, elder of the Crossville, TN church, as well as from Jim Waldron, Garry Jones and Don Iverson, evangelists to India, the Bayamón leadership decided to give the entire contribution of the last Sunday of October for works in India, matching it with an equal amount from funds already on hand. We urged the membership to give generously, and they did, for a total just short of $6,000.00. The sum was rounded out and doubled, for a Grand Total of $12,000.00. These funds will cover specific benevolent and evangelistic works detailed by us to the two congregations responsible for getting them to India, the Crossville, TN and Clinton, TN churches. -More funds to the Dominican Republic. For years, the Bayamón congregation has regularly contributed to make possible benevolent and evangelistic works on our neighboring island of Hispaniola, specifically, the southwestern area of the Dominican Republic, and we continue to do so. After the campaign by nine Bayamón members in that area during June of this year (See page of photographs), we decided to help two preachers for a year at a cost to us of $1,560.00. These two work with congregations in a very poor, country area. We also sent $1,500.00 to help the El Jobo church lay a concrete slab and raise block walls to about six feet high, thus assisting them in having their own meeting place. Recently, we received pictures showing that project well on its way to completion. -“Llenar toda silla” –“Fill every chair.” We set November 15 as the Sunday to “Fill every chair in the auditorium.” We did! And had to bring in more. Attendance was at least 165, breaking the previous record of 151. Two photographs are included in this report. -Bible study to be published in a newspaper in January. Half page, at a cost of about $2,200.00. The text is prepared. When this becomes a reality, we will provide more information. -The “Young Adults” of the Bayamón church are consistently doing good works which they plan and carry out on their own initiative –helping older members with their properties, visiting hospitals or special homes for retarded children, providing essentials to some needy, hosting activities for their children, distributing literature, sometimes cleaning the meeting place, etcetera. It is very encouraging to see them involved in this way. Supervised by the leadership, young men of this group are responsible for planning and carrying out the worship service for the last Sunday of each month. -Parking lot paved. Investing about $13,000.00, we had the parking area in front of the building paved. Gravel, previously covering the lot, made it difficult for the elderly, infirm and ladies to cross the area to the steps. Now, we can paint parking lines on the paved area, also marking parking for the disabled. We take this opportunity to wish for each and every one of you a very happy New Year. Again, we express our great appreciation for your continued support as we persevere in the effort to teach more and more souls the gospel of Christ, and help edify those who are already in the Kingdom.